Looking ahead to Ohio State, the Ducks are obviously up against a solid team and a historic program. 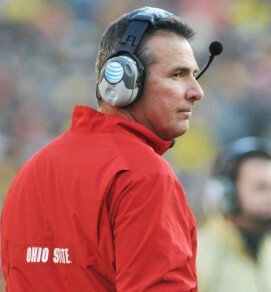 How did Coach Urban Meyer assemble this team? How did the pavement-pounding days on the recruiting trail translate into a title game experience? The rich history of Ohio State ranges from coaching great Woody Hayes to seven Heisman winners: Les Horvath (1944), Vic Janowicz (1950), Howard ‘Hopalong’ Cassady (1955), Archie Griffin (1974 and 1975–only two time winner), Eddie George (1995), Troy Smith (2006) and includes great players like Jack Tatum, Chic Harley, Cris Carter, Chris Spielman, Orlando Pace and A.J. Hawk. WR: Evan Spencer: 6’2″ 208 SR: 3-Star WR from Vernon Hills, IL: Also offers from Iowa, Nebraska, Oregon and Wisconsin. TE: Jeff Heuerman: 6’5″ 240: 3 Star TE from Naples, Florida: Also offers from Iowa, LSU, Michigan, South Carolina, Tennessee and Wisconsin. 2014 2nd Team All Big-10. LT: Taylor Decker: 6’7″ 315 JR: 4-Star OT from Vandalia, Ohio: Also offers from Indiana, Michigan, Notre Dame and Wisconsin. 2014 2nd Team All Big-10. DT: Michael Bennett: 6’2″ 288 SR: 4 Star DT from Centralville, Ohio: Also offers from Michigan, Notre Dame, Penn State, Stanford and USC. 2014 2nd Team All Big-10. WLB: Joshua Perry: 6’4″ 252 JR: 4-Star LB from Galena, Ohio: Also offers from Cincinatti, Duke and Michigan State. 2014 2nd Team All Big-10. CB: Doran Grant: 5’11” 193 SO: 4 Star DB from Akron, Ohio: Also offers from Arizona, Michigan, Michigan State, Oklahoma and USC. 2014 2nd Team All Big-10. Nickel: Armani Reeves: 5’10” 198 JR: 4-Star CB from Roxberry, MA: Also offers from Michigan, Notre Dame, Stanford and Penn State. P: Cameron Johnston: 6’0″ 195 SO: from Gleelong, Australia: Former Australian Rules Football Player. With well-recruited players on both teams, this will be one fine game!